House Democrats this morning brought climate change back to the political forefront for the first time in nearly a decade and were met with a Republican tone shift far from the skeptical attitude the GOP has taken to the issue for years. Democrats, unsurprisingly, talked about the issue in broad strokes, at times comparing it to the moon landing and the nation's other great scientific and technological challenges. "In the 1960s, our government and our nation's best rose to the Sputnik challenge by sending a person to the moon. 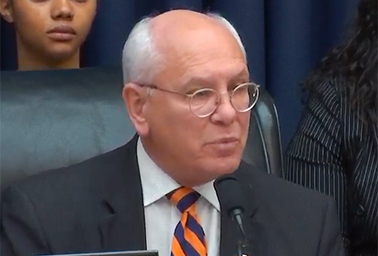 Today, our course remains unclear," said Rep. Paul Tonko (D-N.Y.), chairman of the E&C subcommittee. "How our committee responds at this inflection point will define our nation for the next half century and beyond." The tone shift wasn't universal, but it was surprising, even though the party still overwhelmingly opposes carbon pricing and other more ambitious solutions proposed by climate advocates. Republicans also honed in on the "Green New Deal," an interesting point of focus, since even Tonko and full Energy and Commerce Chairman Frank Pallone (D-N.J.) have expressed skepticism about the progressive policy platform. Subcommittee ranking member John Shimkus (R-Ill.) lamented that climate activists often push for "top-down" solutions to climate change and ignore the importance of nuclear power. He noted that U.S. Energy Information Administration projections suggest fossil and nuclear energy will remain dominant in the power sector until at least 2040. Full Energy and Commerce Committee ranking member Greg Walden (R-Ore.) similarly acknowledged that climate change is "real" but asked for a "longer conversation about the Democrats' Green New Deal." "We have heard about general tenets of the plan for the U.S., such as all renewable electricity generation by 2030, all zero emission passenger vehicles in just 11 years, a federal job guarantee and a living wage guarantee," Walden said. "We have serious concerns about the potential adverse economic and employment impacts of these types of measures." To put a finer point on the rhetorical shift, Rep. Diana DeGette (D-Colo.) at one point asked every witness before the subcommittee if they believe climate change is happening and primarily driven by greenhouse gas emissions. Every witness — brought by both Republicans and Democrats — answered "yes." "That in itself is a revolutionary step for this committee," DeGette said. On the Natural Resources panel, meanwhile, Chairman Raúl Grijalva (D-Ariz.) pushed to go beyond the "innovation" rhetoric that was so common this morning among GOP members. 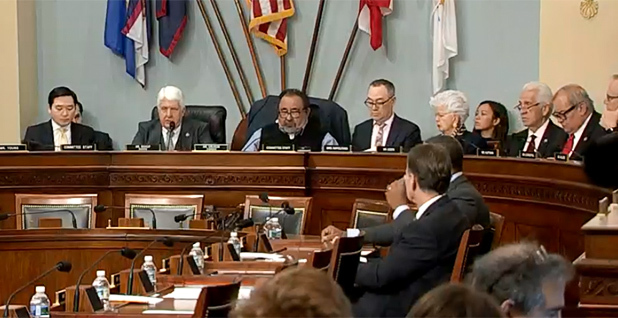 "Today we turn the page on this committee from climate change denial to climate action," Grijalva said in his opening remarks. "We need more than innovation. We need good policies." Ranking member Rob Bishop (R-Utah) didn't touch much on climate science but said he would rather tackle public lands issues more directly in the committee's jurisdiction. Grijalva has dubbed February climate month for the committee, but Bishop questioned whether Democrats are really trying to craft bipartisan legislation on issues such as carbon capture and sequestration or if the hearings are simply for the reporters in the back of the room "so that they can write cute stories." "I know you have made February as climate change month," Bishop said. "I appreciate the fact you picked the shortest month of the year to do that." The Energy and Commerce Environment and Climate Change Subcommittee will do much of the work in developing climate legislation in the coming years, but questions this morning from lawmakers were scattershot, with members focusing on issues that affect their districts or specific areas of interest. Rep. Cathy McMorris Rodgers (R-Wash.) questioned ClearPath Executive Director Rich Powell on the benefits of hydropower, which she called a "clean, reliable, affordable" source of energy. Walden directed his questions about forest management and wildfires, a perennial problem in his district, to Brenda Ekwurzel, director of climate science for the Union of Concerned Scientists. On the Democratic side, Rep. Scott Peters (D-Calif.) probed Michael Williams, deputy director of the BlueGreen Alliance, on the best way to craft a carbon pricing bill, while Rep. Nanette Barragán (D-Calif.) questioned the Rev. Leo Woodberry about environmental justice issues. Pallone focused his questions on addressing climate change in an infrastructure bill, likely the first opportunity Democrats will have this Congress to press the issue in bipartisan legislation. Putting climate provisions in a major infrastructure package would be the thing "we can most likely do on a bipartisan basis and get Trump to sign," Pallone said. The Natural Resources Committee, too, touched on a massive range of issues without much depth, including energy storage, solar, deepwater wind and offshore drilling. Both parties touched on the need for resilient infrastructure in a discussion with Massachusetts Gov. 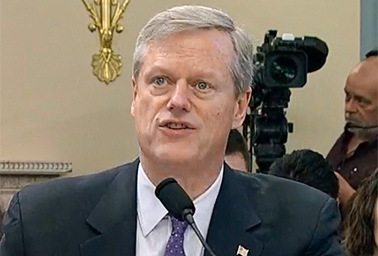 Charlie Baker (R) and North Carolina Gov. Roy Cooper (D). While it's clear there could be areas of bipartisan cooperation on climate in the coming months, Republicans are still resisting any broad legislation to cut carbon emissions, particularly if it incorporates ideas from the "Green New Deal." For the GOP, solutions should be market-based or focused on research and development. As Rep. David McKinley (R-W.Va.) put it, "we all agree" that climate change is largely driven by greenhouse gas emissions, but "where we disagree is on solutions." "If anyone thinks that decarbonizing America is going to save the planet, whether that's 10 years or 20 years from now, they're delusional," McKinley said.